pregnant | I'm not stalking you. The Pharmacy Giraffe. I call him Giraffey. When I was growing up, I lived within walking distance of a pharmacy. I would go there to buy candy. I would go there to buy poster board for school projects. I would go there to buy my mom Christmas stocking stuffers. I would go there for something to do. When I was a little older, I went there with my asbestos friend to look at the teen magazines, which once in a while we actually purchased. You would think they would have been grateful for my business. No. Instead they watched me like a hawk every time I was in the store, apparently expecting me to steal something. The pharmacy had one corner of the store with gifty items. Figurines. Stuffed animals. And the largest stuffed giraffe I had ever seen in my life. I used to hug his neck every time I went in. I dreamed of taking him home with me. He was for sale, but I think his purpose in the store was more to draw the children over to that area. Which he did very well. I remember the price tag on him being $500. Someone else told me $2000. Either way, no one ever bought him. I grew up and moved away. The pharmacy was bought by new owners and moved to a new location. I remember going in to the new pharmacy once and thinking how sterile, bare it looked. And I was sad to find there was no giraffe there. A number of years later, after my asbestos friend had left town and moved back, she convinced me to ride on a Noah’s Ark-themed float for her church for the town festival [She is always tricking me into doing things like that. She is a bad influence.]. Anyway, I met her pastor, who was dressed up like Noah. And looked about nineteen. And his wife, who looked more like Mary looking for a manger than Noah’s wife [She was pregnant at the time]. As you may have guessed, they had animals on the float. Wood-cut outs, along with stuffed animals. The best one, if you asked me, was the stuffed giraffe. 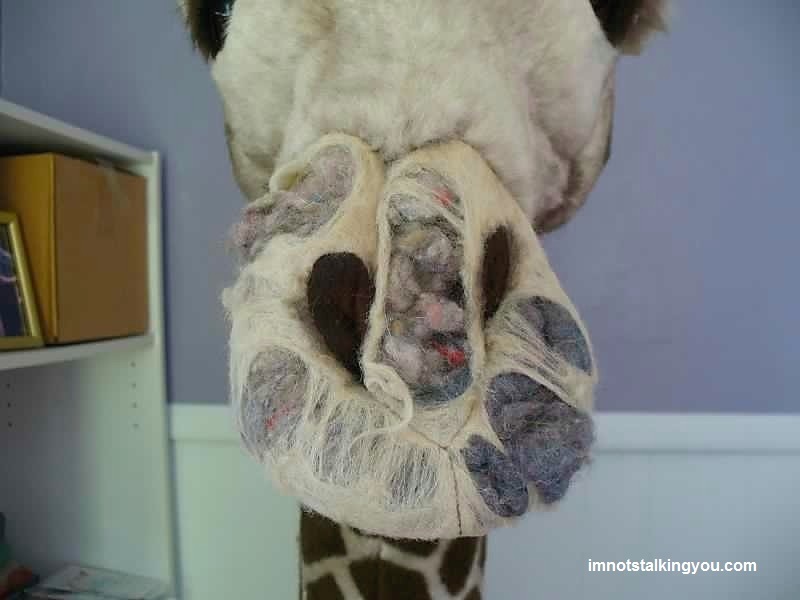 I told my asbestos friend that it reminded me of the giraffe from the pharmacy. She replied that it was the very same one. It made the eight year old in me a little excited. It rained that day and he got a little wet, but it didn’t seem to cause him too much damage. Three years later, I was pregnant with my son. 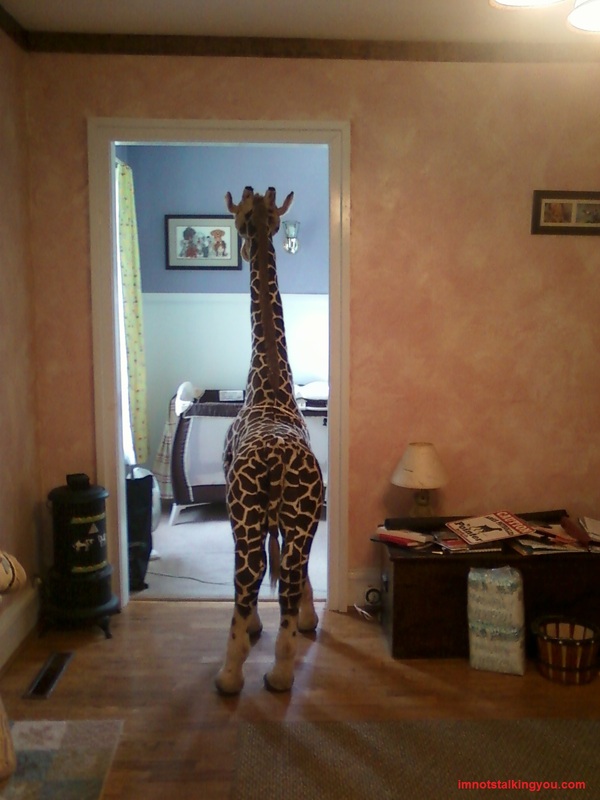 I saw a stuffed giraffe at work. I decided right then and there that my child’s room would not be complete without one. I hoped to get it for free or discounted through work, as that was a big benefit of working there. But I didn’t really want to spend the money. The giraffe work was selling was also way smaller than the one I was used to from my childhood. When I mentioned this to my asbestos friend, as I do with all my obsessions, she told me that the pharmacy giraffe that had rode on the church float was still sitting in the church basement. It had flooded down there and he had gotten a little wet, but it didn’t seem to cause him too much damage. After a quick call, she confirmed that the previous owner no longer wanted it. But, the previous owner said it was CURSED! 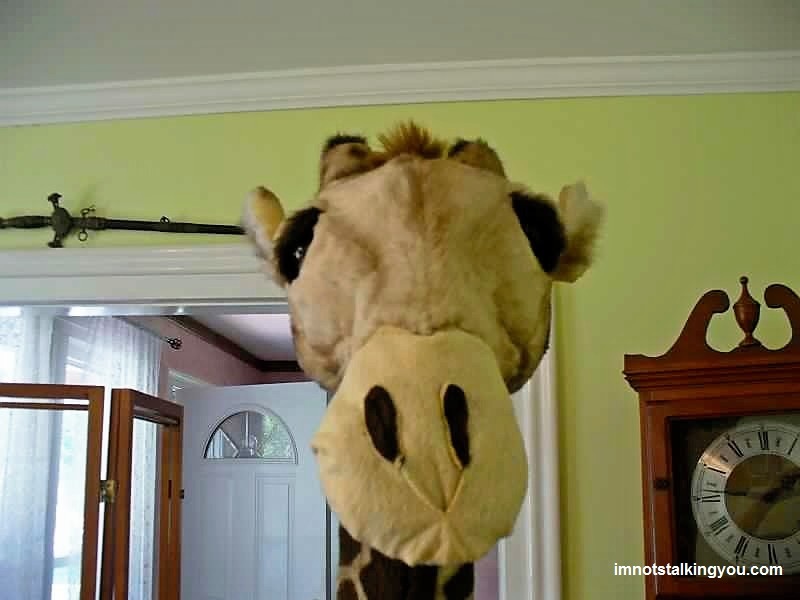 From what I remember, as the story goes, the previous owner bought the giraffe at auction when the pharmacy closed for her mother. But apparently the mother said it was too big and didn’t want it. 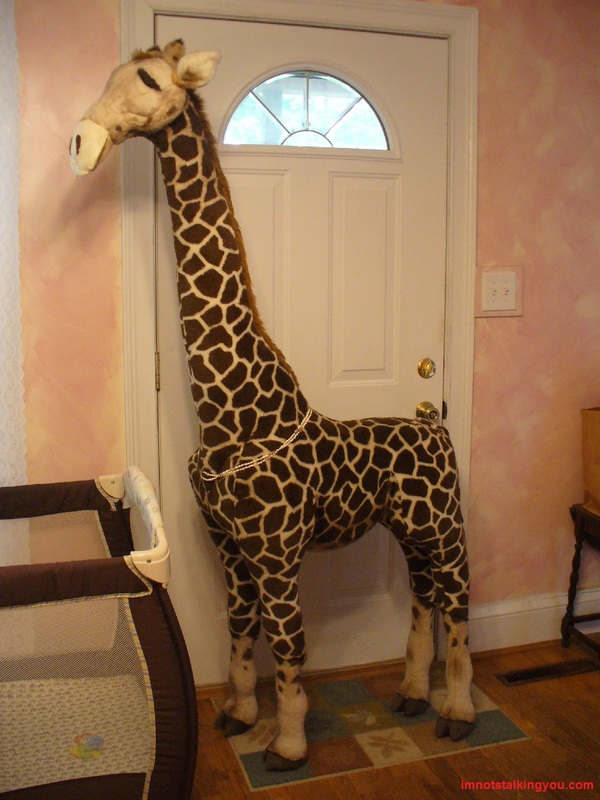 The previous owner had tried to get rid of the giraffe several times. But, apparently, every time someone tried to take him out of the Blissfield village limits, they would experience car trouble, or some other kind of incident. I took my chances with the curse and hauled him home. Not a single terrible fate befell me. That tells me it was fate. I was destined to own him. Once I got him home, that was not the end of the story. Do you remember how I said I used to always go in to the pharmacy and hug his neck? Well, I was not the only one. And it appeared that most people chose to rub his nose, because there was not much left of it. It was time for another one of my unusual sewing projects (ex. Werecart). I spent a Sunday very carefully reconstructing his nose, knowing that if I screwed it up I would be destroying a cherished part of Blissfield history of my generation. Even with all that pressure, it came out quite good. Posted in Childhood Reminiscing, UnProfessional Photography & Artwork and tagged asbestos, Blissfield, giraffe, law of attraction, pharmacy, plush, pregnant, sewing, steal, stuffed, teen magazine, The Secret. Bookmark the permalink.